THIS IS THE FORM FOR 2010. PLEASE REFER TO OUR WEBSITE FOR CURRENT INFORMATION. 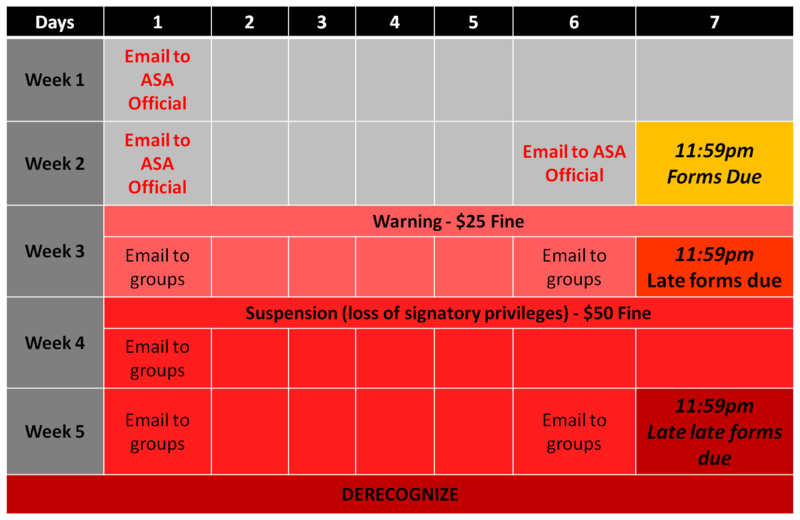 All student groups must have a representative sign this ASA Anti-Hazing Form to confirm that the group will not sponsor or involve its members in acts of hazing, in compliance with Massachusetts Law. The text of the law is below. You must also provide the email for your group membership and this text will be distributed to your group (as required) automatically. DEADLINE: Acknowledgment is due by Friday October 22, 2010 at 11:59pm. Past that date there will be a $25 fine for late submissions. After another week groups that have not acknowledged will be suspended and fined $50 for late submissions. Finally, groups that have not acknowledged by three weeks after the deadline will be derecognized. This timeline is shown in this figure as well. A list of groups that have already submitted is here (check last update time, not updated in realtime). If your group does not appear in the list above, then please email asa-exec@mit.edu. So that the text of the law may be automatically distributed to your members. By checking this, I hereby affirm that I have read and understand Chapter 269: Sections 17, 18, and 19 of Massachusetts Law. I furthermore attest that I will distribute to group members, pledges, and/or applicants, copies of Massachusetts Law 269: 17, 18, 19 and that our organization, group, or team agrees to comply with the provisions of that law. If you have any questions, please email asa-exec@mit.edu. Section 17. Hazing; organizing or participating; hazing defined: Whoever is a principal organizer or participant in the crime of hazing, as defined herein, shall be punished by a fine of not more than three thousand dollars or by imprisonment in a house of correction for not more than one year, or both such fine and imprisonment. Section 18. Failure to report hazing: Whoever knows that another person is the victim of hazing as defined in section seventeen and is at the scene of such crime shall, to the extent that such person can do so without danger or peril to himself or others, report such crime to an appropriate law enforcement official as soon as reasonably practicable. Whoever fails to report such crime shall be punished by a fine of not more than one thousand dollars. Section 19. Copy of Secs. 17 to 19; issuance to students and student groups, teams and organizations; report: Each institution of secondary education and each public and private institution of post secondary education shall issue to every student group, student team or student organization which is part of such institution or is recognized by the institution or permitted by the institution to use its name or facilities or is known by the institution to exist as an unaffiliated student group, student team or student organization, a copy of this section and sections seventeen and eighteen; provided, however, that an institution's compliance with this section's requirements that an institution issue copies of this section and sections seventeen and eighteen to unaffiliated student groups, teams or organizations shall not constitute evidence of the institution's recognition or endorsement of said unaffiliated student groups, teams or organizations.